Yep. Four endless pages of frankly useless detail. Not only is this type of buyer persona development a massive waste of time, it can even have an adverse effect. That’s right. Your marketers, copywriters, and content creators may get so caught up in this made-up story that they tailor messaging exclusively for this Sarah character, excluding a far more true and useful representation of your actual potential prospects (e.g., those buyers who aren’t divorced, don’t drive to work, and don’t drink Earl Grey tea). Are you guilty of this buyer persona frivolity? And they’re all missing the true power of one of the most valuable weapons a content marketer can wield. Keep reading, and I’ll arm you up. You see, a proper buyer persona includes two components. Too many marketers stop at the profile. Or leave the buyer insights portion of their buyer personas looking like an unfinished painting. Buyer insight should detail the buyer’s feelings, motivations, and expectations relating to the part of their life that your product or service will impact. It should identify their goals and doubts, and methods of evaluating products/services like yours. Buyer insight also encompasses the reasons the persona chooses to buy or not buy similar products/services in the distant or recent past. It specifies what time of day they buy, under which conditions they tend to buy, and how long that buying process takes. It also explains what kind of advertising or marketing they like and respond to. These buyer insights are the real key to rock solid buyer personas and content marketing results. And most importantly, they are the details relevant to your service and marketing strategy, nothing more! No favorite morning cup of tea flavors here (unless you’re selling them tea, of course). Tell the agent your friend is tall, white, married with no kids, works as an architect in the city, plays tennis on Wednesdays, likes to drink Guinness, and reads the Times. Tell the agent your friend is looking for a two-bedroom, well-lit apartment with a garden, within a 10-minute walk from a public transit station on the central line, and won’t pay more than $700,000. His wife is concerned about house safety. Which description is more valuable to the real estate agent? It should be glaringly obvious. The inclusion of the buyer insights makes a mahoosive difference in helping the real estate agent show properties that are relevant to the buyer’s interests and needs. Buying insights make your customers and their purchasing journey real. They tell you all the little things that make them like, dislike, act, or flee. And these insights are key in a killer marketing strategy, copy that converts, and a marketing funnel that drives sales. If you know how to gather this info as you market, you’re a long leap ahead of the competition, most of whom just know the most basic stats (yep, those little feeble buyer profiles). For them, the customer is a stranger. For you, it will be like selling to a friend. Starting to understand the power of what you’ve been missing? Adele Revella’s excellent book, Buyer Personas, lays out the methodology and reasoning behind it with crystal clarity. I can’t recommend it enough. In a nutshell, you’ll need to interview people who have recently evaluated your product or a product just like yours. They might have bought or not. In fact, if they didn’t buy – the insights you squeeze may be even juicier. Either way, you want to know why. Find these customers and prospects, offer them a reward for helping you. Get them on a 20-minute recorded phone call with the friendliest person in your team – or, even better, a third-party agency that offers an arm’s length distance, which might encourage the interview subjects to be more open in sharing their real reasons. What triggered your decision to search for a solution like this? What results were you expecting and hoping to get? What concerns did you have that prevented you from going ahead with a solution you didn’t choose? What top three to five factors did you use to compare solutions before deciding on one? What was your personal role in the final decision? Who else impacted the decision? How were they involved and what resources did they trust to guide the decision? What was the overall process of making the decision? What was the first step in your process? And the last? Ask interviewees to tell you the entire story – from the moment they thought “I should consider investing in X” to the moment they parted or didn’t part with their cash. What was the chain of events and thought processes they went through from point A to point Z? And, from their answers, build your list of buyer insights and add the buyer profile demographic and psychographic details. Simplify it all, nice and clearly, and stick it up on your content marketing team’s walls for all to see. The interviews should reveal similarities and differences among the triggers, desired results, objections, comparison factors, and journeys. Group those interviewees with similar responses into a single buyer persona. Not those with similar tea tastes – or even job titles or company types or locations. But those who fit into the same boat when it comes to their entire buyer’s journey – whatever walk of working life they may come from. Before you interview buyers (or potential buyers), you can glean a great deal of insight from your company’s people. Send a message to the people in your organization, paying special interest to your top sales operatives, as they are probably in closest contact with your prospects. Ask them to answer the questions with care and reward the most detailed answers (yes, sales people like rewards, don’t you know?). We’re going to be delving into our content marketing strategy soon, and I need your help understanding our buyers and the journeys they take. I’d like you to think of a recent prospect you dealt with. It could be someone that we sealed the deal with or someone who considered our (product/tool/solution/service) but decided not to go ahead in the end. Both are valuable, especially the latter. What triggered your decision to search for a (product/tool/solution service) like ours? What results were you expecting to get from a (product/tool/solution service) like ours before purchasing? What concerns did you have which may have prevented you from going ahead – with a (product/tool/solution service) like ours in general, and ours specifically? What were the top three to five factors you used to compare with other solutions before making a decision? What was your role in the final decision? Who else impacted the decision? How were they involved and what resources do they trust to guide the decision? And please just jot down a few facts about them, their company, and their position. Please shoot the answers back to me ASAP. This is going to help us nail our marketing funnel! You might find that this exercise leads to a greater understanding of the customer across your organization before you even flesh out your persona. After you conduct the interviews with buyers, see how close the internal assumptions were. If they weren’t closely aligned, it’s even more important to share your fully realized buyer personas across the organization. When you have the insights, you have the answers. When you truly understand what’s going on inside the minds of your buyers at each stage of the sales funnel, you can create the content that helps nudge them closer and closer toward conversion. Let’s imagine you’re selling a shiny new CRM platform, for example. Your interviews lead you to create a persona for buyers looking for a CRM system to cope with their startup’s fast growth. You create a blog post, How to Keep on Top of Your Startup’s Rapidly Growing Client Base,” to tap into that trigger. And voilà. You’ve enticed that persona – because of your buyer insight research – into the top of your inbound funnel. You’ve also discovered through the interviews that prospective buyers perceive your company’s lack of brand recognition as a negative. Now’s your chance to preempt the objection on your website. This tactic not only overcomes the objection before the prospects have time to dwell on it, it shows them that you understand their thought process. You “get them.” You’re similar to them and you’re cooperating with them to achieve a mutual goal (which are key ingredients in getting prospects to like you; the fifth principle of persuasion detailed by the legendary Robert Cialdini). Next, your buyer’s journey insights tell you a portion of your typical buyers are fresh-thinking marketing managers with big ideas who have to run everything by their old-fashioned CEOs. These CEOs are the ultimate decision-makers, but not the buyers who interact with your brand during the buying process). And they tend to think spreadsheets are all fine and dandy. They dig the status quo. Armed with this knowledge, you can help those innovative marketers influence their bosses’ decisions and preempt the resistance. You email an article into their inbox, entitled How to Prove to Your CEO That a New CRM Will Boost Their Bottom Line. Accompanying the email is a downloadable PDF report with all the relevant stats needed to sway your buyers’ stubborn CEO, which they could simply hand to him or her. You’ve made that buying hurdle a whole lot easier for your buyer to hop over – with pre-calculated, pre-crafted, triggered content. No salesman required. Boom! Thank you, buyer insights. 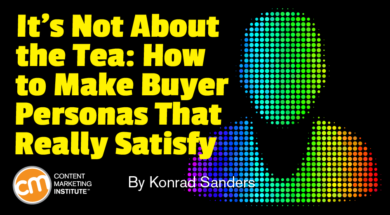 See how much you can ethically persuade your buyers when your personas forgo their favorite tea or marital status and comprehensively detail the buyer insights relevant to the journey they might take with you? Now go forth and gather. People who attend content marketing world like to gather with other like-minded individuals in an environment that’s fun, educational, and motivating. Is that you? Register today for Content Marketing World Sept. 4-7 and use code BLOG100 to save $100.